« Q: Where the Hell have I been?? Long time since a meaningful post. Timely is an update on the Odyssey as over the past couple of days I’ve been successful on eBay. Recalling the last state of play on this, I had received a superior copy of Minions of the Moon to that I already had, and a nice Plague Ship was on the way. Well, Plague Ship arrived and a misdirected Gray Lensman (amongst a couple of other things which I’ll talk about presently..) landed with my parents in New Zealand. 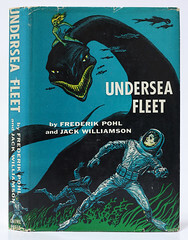 Arriving here about a month ago was the middle third of Frederik Pohl’s and Jack Williamson’s Undersea Trilogy – Undersea Fleet. Over the past week I’ve picked up Talbot Mundy’s Purple Pirate and another Williamson title in conjunction with James Gunn – Star Bridge. Both these are on their way, and Doc Smith’s Gray Lensman will be in an aid package from the homeland due to be sent soon. Taking these into account, there are only 16 titles left to acquire. ‘Only’ is slightly misleading as the balance of the catalog are all (with one or two exceptions..) perennial big ticket editions such as the 6 remaining Conan titles, the Foundation series, Simak’s City and… I, Robot. 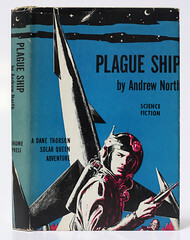 This entry was posted on January 3, 2013 at 10:19 am and is filed under New Arrivals with tags Andre Norton, Andrew North, Edward E. Smith, Frederik Pohl, Gray Lensman, Jack Williamson, James E. Gunn, Minions of the Moon, Plague Ship, Purple Pirate, Star Bridge, Talbot Mundy, Undersea Fleet, William Gray Beyer. You can follow any responses to this entry through the RSS 2.0 feed. You can leave a response, or trackback from your own site.